I was challenged by Mardra Sikora to join in the "What are you grateful for?" Blog Hop. Never one to back down from a challenge--especially a good one like this--I'm meeting her challenge and posting the things I am grateful for. Her point is that we get so bogged down in the 'stuff' of life that we forget to remember the simple joy that comes from living. And as scientists have proven, but most of us have already known, an attitude of gratitude makes you a happier and more productive person. Who will join with me and answer the grateful challenge? 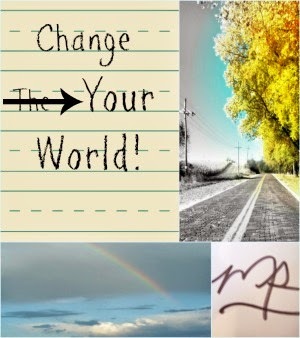 Mardra is calling it Change Your World Wednesday. Who will join us? What are you grateful for and positive about right now? The challenge is to name 10 things. But, start small and leave a comment with your #1 grateful and positive thing right now. If you are really up to the challenge, create your own post and join in the hop. 1. My family is healthy. 2. My high school BFF took me to see Wicked on Sunday (and challenged me to a blog hop today, in case you wonder who she is). I'm in love with Wicked and am still singing the songs four days later. 3. There are only 7 days left in the school year. I love summer vacation and spending time with my kids and having a MUCH more relaxed lifestyle. 4. I'm still pumped up that Andrew was named one of Ten Outstanding Young Omahan Teens (TOYO Teen Award) for his volunteerism and leadership. 5. Rebekah gets to play in a soccer tournament. 6. Nathan was placed in advanced math for next year. 7. I was able to clean out the storage unit I rented after the big fundraiser walk (and in under my 30 days rental). 8. I have a husband who is still crazy in love with me (like I'm crazy in love with him) after 22+ years of marriage. 9. I have a car to drive, a roof over my head and food in my belly. That makes me 'rich' by the standards of most of the world. 10. I know Jesus as my Lord and Savior. My faith carries me through many days of uncertainty.